Here is the first in the series of "Meet Our Advertisers": Jen from MOMSPatterns! I've been in business on eBay since 1998, and owned my own vintage sewing pattern website since September, 2006! I used to sell costume patterns, until a dear friend of my mother's found a box of 1940s patterns in her aunt's attic. She asked if I'd be interested in selling them, and I originally, very snobbily said, "Oh, I'll TRY but I can't see that there's a market for USED OLD PATTERNS." Imagine my surprise and delight when they sold for more money than my NEW patterns! I adore the styles and fashions from the past, so started focusing on the vintage styles and couldn't be happier having a job dealing with what I LOVE. I used to foreclose houses for a large, well-known bank! I'm in a town called Orange Park, which is right outside of Jacksonville in Florida. Hot, humid & sunny … all the time. Dabbling in vintage clothing, I found nearly ninety (yes, 90!) vintage new old stock DeWeese bathing suits from the 1970s. My pals Michelle from Dollhouse Bettie and Ang from Dorothea's Closet Vintage are selling them on consignment for me and we are reveling in the whole Charlie's Angels feel of them! Most of the 1930s and 1940s FABULOUS DuBarry patterns I recently added … They're just fantastic … really! A box of 100 or more uncut 1920s McCall's vintage sewing patterns … An original Fortuny Delphos evening gown … and good homes for any of my beloved patterns for sale! 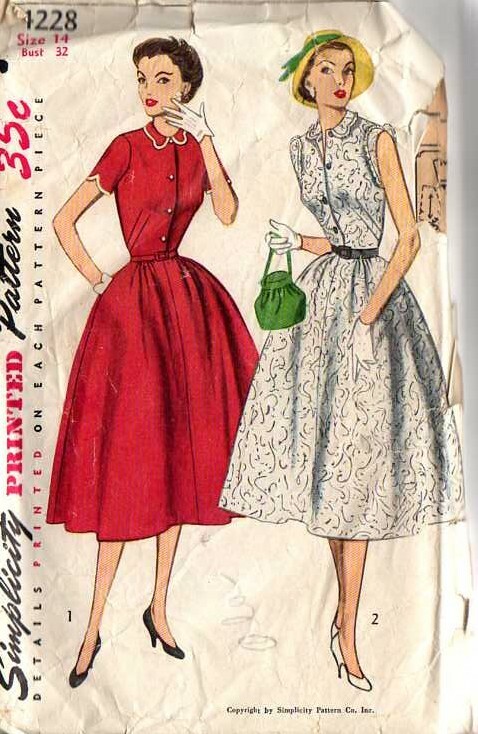 What do you enjoy most about working with vintage clothes and vintage sewing patterns? I love the quality of vintage clothing. The attention to details … the shirring, the draping and the utter GLAMOUR of the days gone by. May I Link To You / Blog About You / Advertise For You? I wake up to emails from people telling me that they just found the MOMSPatterns site and they had SO much fun looking at styles that their mother or grandmother had made for them … when I can connect someone with a pattern they used to love SO much but lost … and when there's a nice stack of orders to get filled & shipped! Make sure I was number one on Google for ALL vintage sewing search keywords & combinations so I could make sure I was reaching anyone who was interested in vintage, sewing, and vintage sewing! Jen has also offered to run a month long sale for you! Coupon code 'nowiknowjen' 15% off. From today until the end of the month! More coupon details … you can use the code over & over & over again all month long, so as you see more patterns added throughout the month, you can STILL use that code! Free s&h to USA & Canada with the purchase of 5 or more patterns, discounted shipping rates available for international orders. Well that was fun! And I’m happy to be the first poster to say so. Sad story with a good ending: about a year or more ago, I decided that having so much stuff around me doing nothing was not healthy in a “feng shui” sort of way. As I haven’t sewn anything in Many Years, the patterns I’d hoarded from my teens & my daughter’s youth were obviously useless, so I put those out in the recycling bin (or burned them), sent fabrics to local charity & gave the best to one friend who actually sometimes sews.Good part – about the time when I started feeling like I needed to work with my hands again (“mid-life crisis”), I discovered DAD & something called the Blogophere. I credit Erin with re-invigorating my old love, am having a great time trying to remember the stuff that I used to do so easily (altering patterns, sewing in a zipper,,,). I’m even raiding my own mother’s lovely old fabrics – which she hasn’t been so silly to throw out (she doesn’t throw anything out). I spent one night digging through an old Chinese camphor chest of hers, and dragged away pieces to “seed” my new stash. She found old letters & pictures from the 1940’s &50’s & it really was a wonderful bonding time. She can’t wait to see how I’m using fabrics these days.So, my hat is off to Erin, and to all you people whose enthusiasm & crazy humour are making such a cheerful impact on my life!Thank very much. Great interview! It’s always interesting to hear stories of people establishing a new career/business, just by chance. You just fall in love with those vintage patterns! I found my first one by chance at a flea market – a 1930s Butterick pattern for a “frock” – and I’ve been hooked ever since. Forgot to say – I’m surprised she doesn’t sew! Just goes to show that you don’t have to sew to appreciate these gorgeous old patterns! Hi Jen!! !Jen and Janet (Lanetz) get almost 100% of my vintage pattern dollars. Of all the stores I have contacted for this and that, they are the 2 that not only respond (and promptly) but seem like really nice people, too.New DuBarry’s?!?!?! Gotta go see!ps the irony. I am currently temping for a real estate consulting firm…acquisitions, relocations, er, condemnations… etc. Dahling, you cannot sew? I understand…I have a seamstress on 24-hour-call. But it’s because I don’t soil my hands with actual work. The things you learn! Ciao! Speaking of Wish Lists, I hope that should anyone, Jen included, spot Butterick 2241 anywhere, they’ll please let me know. It’s kind of a dowdy dress, part of that 4-Yard Line Erin discussed a month or so ago. I don’t know why I’m so obsessed, but I am, and MUST make it in white and get it out of my system 🙂 Have nice weekend, all! Great post. I think I will certainly have to use Jen for my next pattern shopping experience. Last time I bought something on Ebay , after bidding frantically, it arrived only to discover that it was only the magazine illustration and instructions – No Pattern! The girl who sold it to me said she doesn’t sew, so hadn’t noticed a minor detail like that. I too have to chime in and thank Erin for awakening in me a love of vintage patterns! I am hooked. A few years back I too dumped all my old patterns – I never had the “vision” of what they could be. But I will not dwell in the past – this is just an opportunity to find more. I now head immediately to the stash of patterns in every thrift store I frequent. And I have just placed an order with MOMS for 5 patterns that I just had to have! Thank you, Jen, for a very easy to navigate site. I look forward to your new additions! Me too! Your prices seem to be very reasonable – that’s key to us sewers!